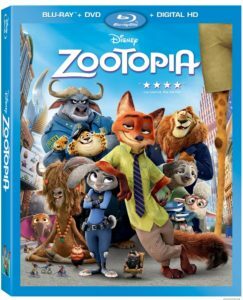 Zootopia Blu-Ray Review - Are You Screening? There was a point when you had to wonder about Disney films, especially when Pixar seemed to putting out the movies to watch. But, with Frozen, Big Hero 6, and now Zootopia, Disney is amazing audiences again. Not that Disney films were ever disappointing, but consistent 10/10 ratings is a different level. The story of Judy Hopps (Ginnifer Goodwin), the cute and fuzzy bunny who just won’t give up on her dreams (despite her father’s advice), and Nick Wilde (Jason Bateman), the con artist fox, quickly became one of the most celebrated films of the year. 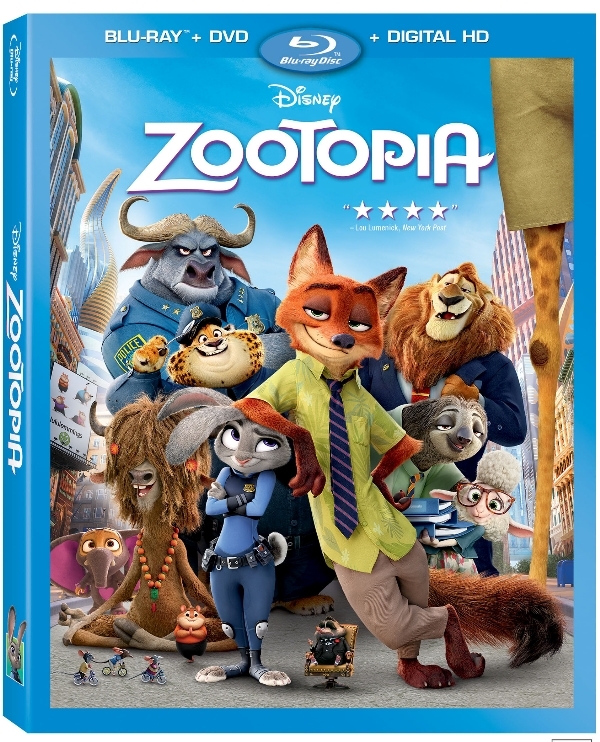 See our full Zootopia movie review here. Zootopia, though almost bizarrely unassuming in its delivery, manages to mix genres, offer up characters most movies should envy, and all while mixing in fun and beauty in a way that would make Walt himself proud. Best of all, as you might easily imagine, the film tackles societal issues in a way that will have kids thinking. The Blu-Ray release, while not overloaded with extras, gives some great bonus features that help to highlight some of what makes the movie best. Generally, animated films have their work cut out for them when it comes to putting together bonuses that actually help sell, and/or can offer something that will be watched at all. Zootopia may have some of the standard features, but they tie in nicely with the overall effort, and really add some value. Deleted scenes may not always pull anyone in these days, but this release has an alternate opening along with six deleted scenes, and they not only have optional introductions by the film’s directors, they are given weight by way of the decisions behind either removing or altering the scenes. While some are as interesting simply to get a look at how much an animated film can change over the course of its lifetime – like the spectacular “Alternate Jumbo Pop,” which is from a time when Nick was really the main character – some show off the tough decisions that have to be made for the overall good of the film – like “The Taming Party,” which is a scene you’ll wish could have found its way to the final cut. That’s just the deleted scenes. NATURAL ENEMIES — Zootopia’s first bunny officer Judy Hopps finds herself face to face with a fast-talking, scam-artist fox in Walt Disney Animation Studios’ “Zootopia.” Featuring the voices of Ginnifer Goodwin as Judy and Jason Bateman as Nick, “Zootopia” opens in theaters on March 4, 2016. ©2016 Disney. All Rights Reserved. Moving into the meat of things, the release has two truly magical bonuses – Zoology: The Roundtables, and The Origin of an Animal Tale. Together these two make for about 30 minutes, and cover the inspirations, themes, animation process, and otherwise give you an amazing look at what goes on during the production process. What’s best here, especially for younger crowds, who may not be overly interested to delve into many behind-the-scenes aspects, is that the filmmakers connect their decisions to what they hope audiences will get from the film, whether that’s just a laugh, or something to think about in their own lives. They wonderfully take this to a rather deep level, even talking about the construction of characters by the way they are made to react to seemingly innocuous circumstances. The release also includes a research featurette, which kids will love, and this one not only shows the crew seeking out animals and their environments, but talk at length about why this process is actually very important. You also get the music video, a featurette on the score, a look at some of the Easter Eggs, and a surprising little gem that showcases some of the characters that didn’t make it to the film. Overall, this one is really a no-brainer. It isn’t just one of the best animated films of the decade, which should be enough, but this is a release that pays some real attention to the bonuses. In terms of pure time, this one doesn’t measure up to some of the massive releases, including animated films, of the last few years, but there’s a lot of quality over quantity here. If you have bonus features that get watched repeatedly, that’s already a rare win. Be sure to check below for more info on the release. Alternate Opening – Young Judy Hopps rescues a fellow classmate and realizes she can reach beyond a life in carrot farming to a future in law enforcement. Wild Times! Pitch – Nick desperately pitches the bankers of Zootopia on funding Wild Times!, an amusement park made exclusively for the predators of Zootopia and a sure-fire, money-making scheme for Nick and his friends. Detective Work – Judy borrows a fellow police officer’s computer to conduct research, which turns out to be no small task. Alternate Jumbo Pop – In this early version of the story where Nick was the main character, the filmmakers and Jason Bateman were able to take hustling to a new level. Hopps’ Apartment – When Judy’s entire family pays her a surprise visit they are shocked to discover the company she’s keeping. The Taming Party – In this emotional clip from an early version of “Zootopia,” Judy attends her first “taming party” and gains a deeper understanding of the plight of the predator. Research: A True-Life Adventure – The filmmakers traveled the globe to find inspiration for the diverse characters and amazing city of Zootopia. They reflect on the importance of research and how a deep dive into animal behavior at Disney Animal Kingdom theme park and a deep immersion into animal society on the African savanna shaped and inspired the characters of Zootopia and changed the filmmakers’ lives forever. ZOOTOPIA – Pictured (L-R): Judy, Bonnie, and Stu Hopps. ©2016 Disney. All Rights Reserved. ZOOTOPIA – Pictured (L-R): Judy Hopps, Nick Wilde. ©2016 Disney. All Rights Reserved. ZOOTOPIA – Pictured (L-R): Nick Wilde, Judy Hopps, Mr. Big. ©2016 Disney. All Rights Reserved. ZOOTOPIA – RAINFOREST DISTRICT. ©2016 Disney. All Rights Reserved. Possibly the best movie of the year managed a release worthy of the multi-layered film. The bonuses actually deliver a lot of value for fans, which is becoming somewhat rare.